I have been to almost all of the MACNAs, and, as I’m sure that I’ve said before, going to MACNA is a great experience. For me, although I’m always interested in new information presented by the speakers, and I’m always looking for new writers and information for this publication, the best part of MACNA is meeting and making friends. In this connection, getting together with Morgan Lidster of Inland Aquatics — InlandAquatics@aol.com — and Bruce Davidson owner of Sandy’s Pet Shop — sandyspetshop.com — was a special treat. After the conference, in Boston this year, we drove back to my house on Cape Cod, where we had a home cooked lobster dinner. Both Morgan and Bruce run retail aquarium businesses that are shinning examples of how it should be done. They know what they’re doing, give their customers good advice, and only sell animals that are healthy. If all aquarium stores followed their example animal loss would probably be one tenth of what it is. Following is a wonderful event that took place in Bruce’s store. In late June of 2004, I received a shipment of Tridicnad clams from one of my west coast distributors. As my customers were checking them out someone noticed that a 5-inch_ Squamosa had a pair of shrimp inside it. 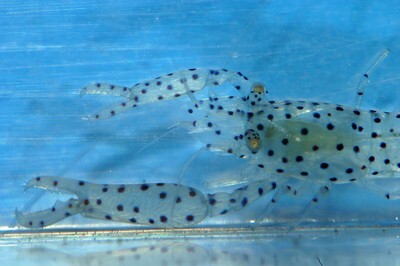 The shrimp were clear with black spots, about a half-inch long and were hanging around the gills. 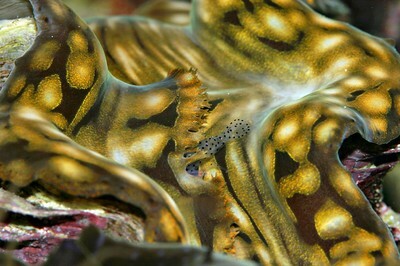 I didn’t get more than a glance at them before they moved deeper into the body of the clam and out of view. I shot out an email to Kevin Gains and Rod Burk to find out if they see anything like this in the ORA clam farm. Yes, and they seem harmless, was the answer I quickly got back from both. 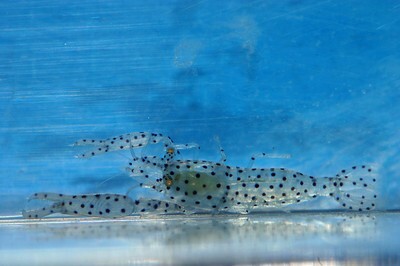 The next morning I came in to find that the clam did not recover from the stress of shipping and the shrimps were gone! They were in a small 30-gallon tank and I managed to locate one of the shrimps hanging onto another clam at the base of the shell. I quickly netted it and put it in a specimen container to take a few pictures. Finished there, I carefully sucked the shrimp intopipette and squirted it into the incurrent siphon of another clam. 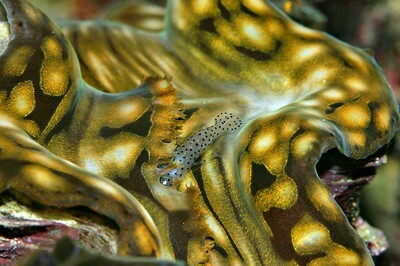 This Squamosa _is in my 180-gallon display tank and about the same size and color as the one it came in on. What happened next was quite a surprise. 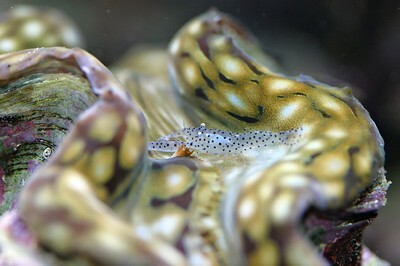 The shrimp jumped out of the clam and onto the substrate at the base of the shell. Over the next 20 to 30 minutes the shrimp took it’s time and slowly moved back to the top of the clam. Things started with the shrimp sneaking onto the mantel from the back and making it’s way around the incurrent siphon to settle between the in and out where it just sat for several minutes taking a rest. At first the clam kept retracting but soon the clam quit flinching every time the shrimp moved. The shrimp started getting closer to the incurrent opening. This shrimp really took it’s time and if the clam moved even a little bit it would back off, wait a few minutes and try approaching again even slower than before. Over time the shrimp’s persistence paid off. 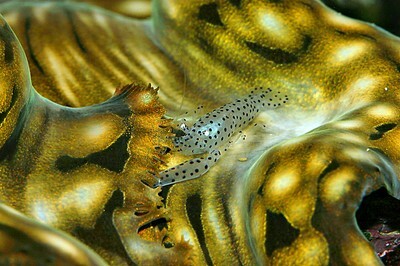 The clam was receptiveto its advances and the shrimp made its move. It was as if there was an understanding between the two and without hesitation the shrimp moved in and the clam didn’t even flinch. It has been 3 months since and although I can rarely get a glimpse of the shrimp the two are doing great. The photographs were taken by Bruce’s friend Will Heaton. NOTE: Can anyone identify this shrimp? If you can, please post it in my Editorial Discussion forum. One of the chores that most reef keepers face is cleaning the front glass, especially scrapping off the hard coralline alga. If you have 10-foot reef tank like myself it takes a lot of scraping, and as corals grow closer and closer to the front glass it is often hard to adjust the angle of the scrapper so that you don’t brake off pieces of coral. In the past I have made some by using scrappers made for removing wall paper or paint from windows, but their blade angle was not adjustable. The company Aqua Medic showed at MACNA a scrapper that is the answer to my dreams. The stainless steel blade is 6-inches wide, the head angle is adjustable, and its handle (female screw type) will take a broom type handle of any length. 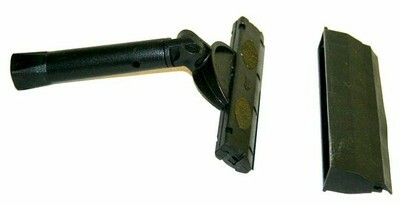 Other than the blade the tool is made of hard plastic, and over the blade there is a removable rubber blade which can be used to clean the outside glass. If interested, Marine Depot, one of our sponsors carries Aqua Medic products. Note, you may have to be patient, asthis is a new product.